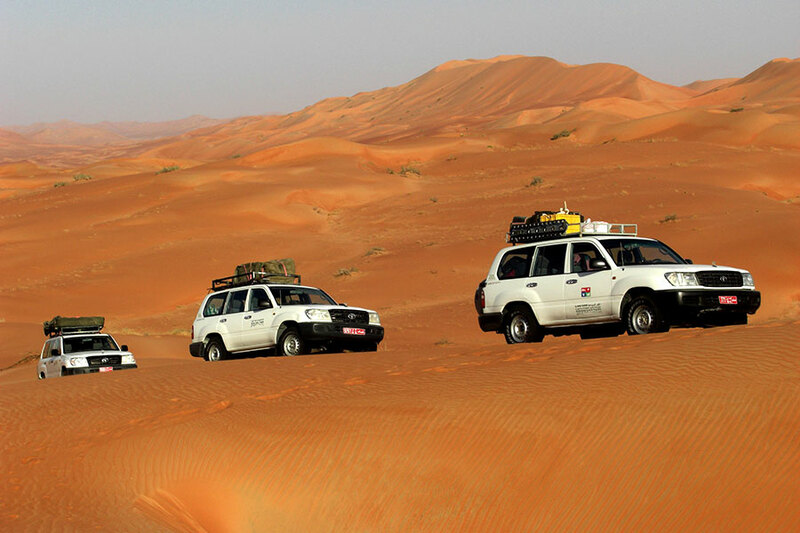 A 4WD adventure to discover the treasures of Oman. The rugged Hajar mountains dotted with tiny villages, the ancient oasis city of Nizwa protected by an impressive fort, the pink dunes of Sharqiya Sands, the natural pools of Wadi Bani Khalid: a succession of emotions and colors that will culminate with the visit in Salalah, an ancient outpost of the Incenso street, and its traditional suq, wrapped in the scents of spices. Flight from Italy to Muscat. Arrival in the evening. Transfer to the hotel and overnight. After visiting the Great Mosque of Muscat, a splendid example of modern Islamic architecture, with 4WD we will head south-west through the mountainous region of Hajar, a wonderful scenery with peaks reaching 3,000 m.
After a stop at Nakhal fort, overlooking the fertile plains of Batinah, we will climb up to a step at over 2,000 m. with an amazing superb view of the Jebel Akhdar mountain range. Picnic lunch at Wadi Bani Awf. 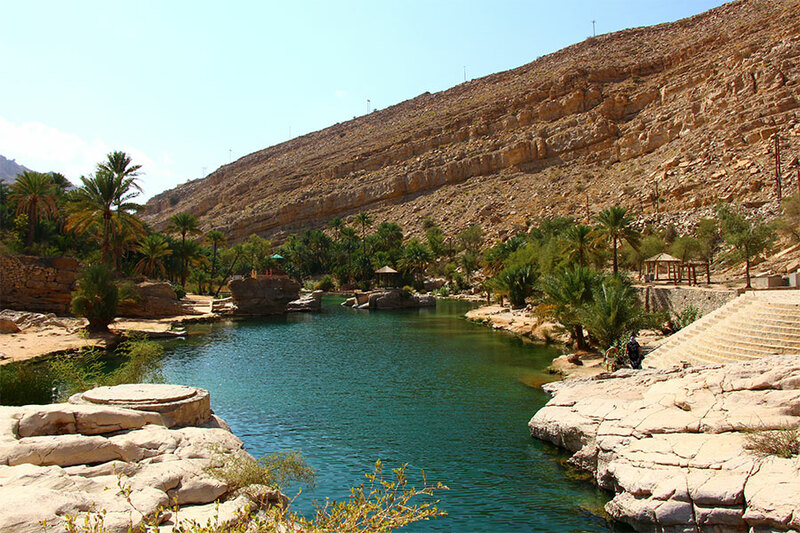 We will visit the village of Al Hamra and its palm grove, characterized by an extraordinary irrigation system consisting of canals, the falaj, which bring water from the mountain to the oasis and spread it on the plantations. 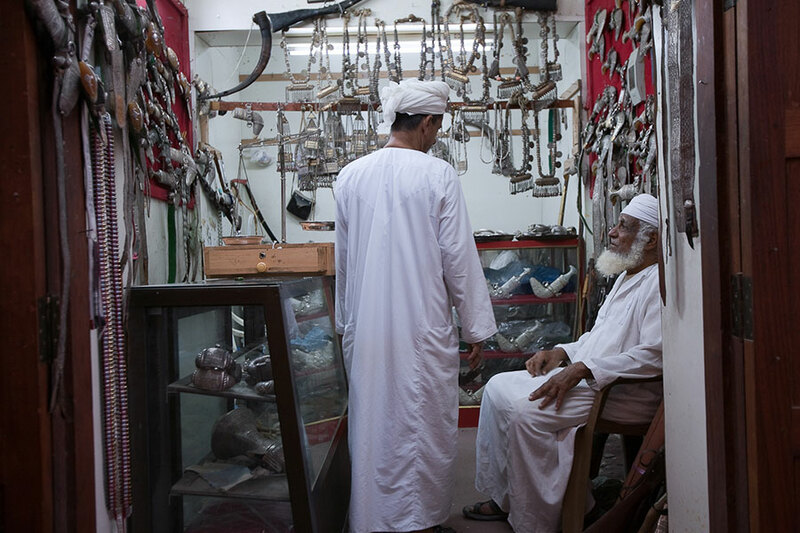 Nizwa, also called the "Pearl of Islam", is in a plain surrounded by a thick oasis of palm trees. 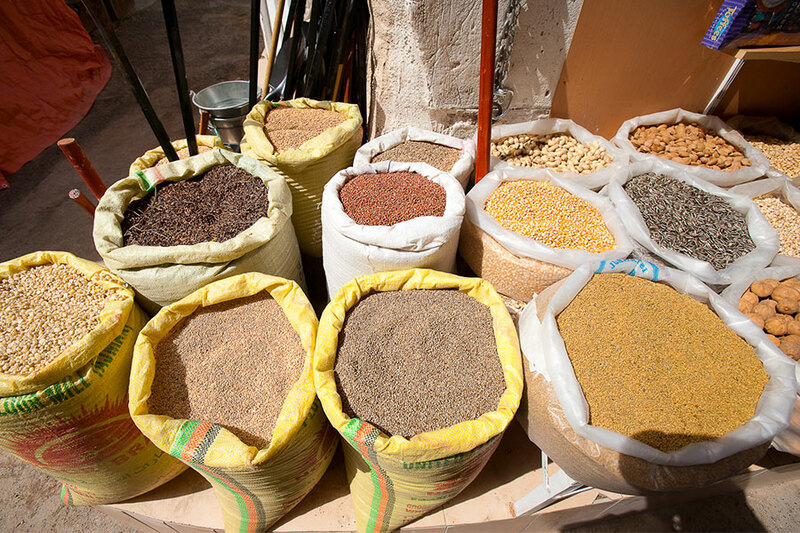 We will visit the animated suq, where you can find typical products in rich in colors and perfumes, and the seventeenth-century fort that dominates the city with its tower more than 40 meters high. From the top you can enjoy an exceptional view of the Hajar mountains and the date orchards surrounding the city. From Nizwa we will drive to reach the village of Mintrib, where we will have lunch in a restaurant. 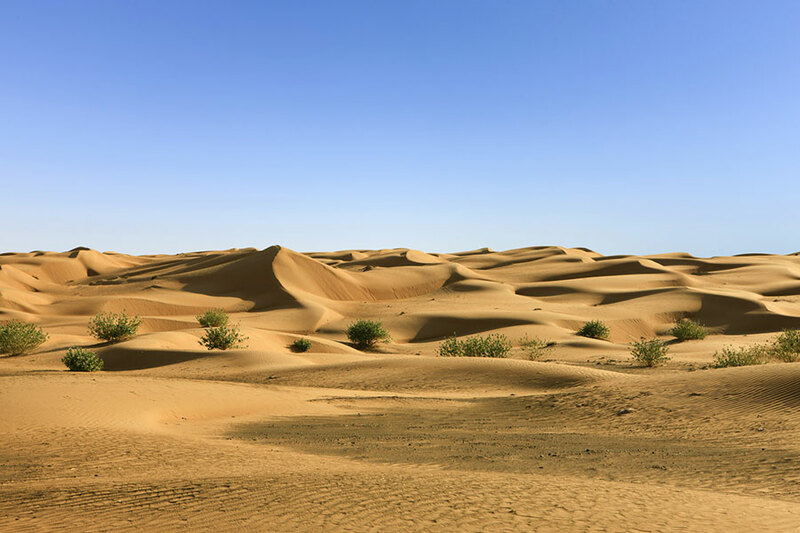 In the afternoon we will enter the orange desert dunes, where you can meet Bedouin tribes camps that for centuries have been living in Sharqiya Sands, whose women still wear the typical burka, black facial masks. 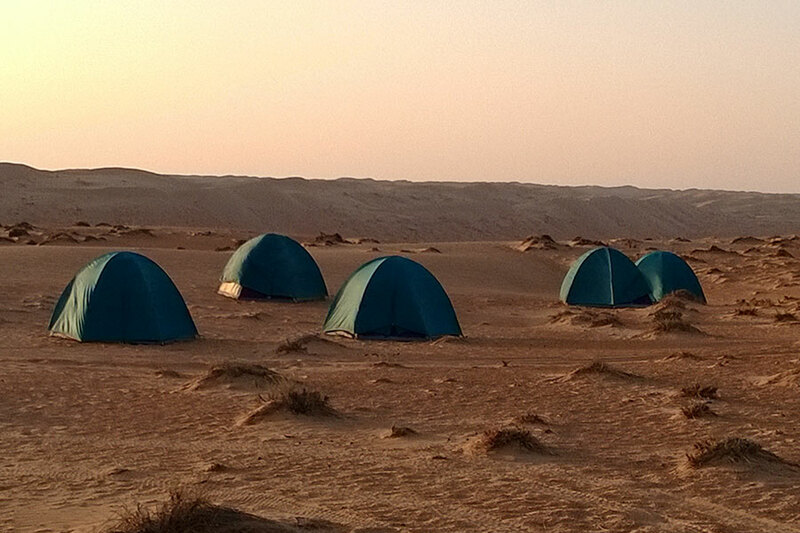 After a few hours in this beautiful desert we will leave for Wadi Bani Khalid, where we will have the opportunity to admire some natural pools of water. 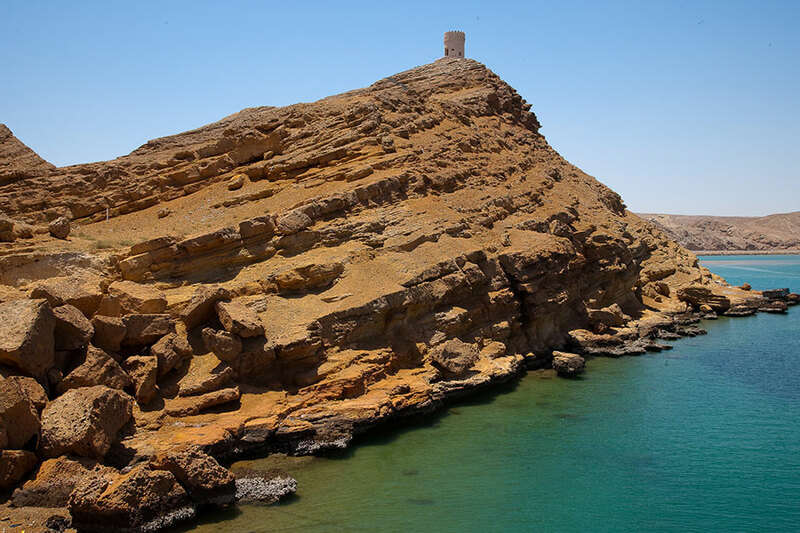 In the afternoon we will arrive in Ras Al Haad, the easternmost point of the Arabian peninsula that has become a National Park. 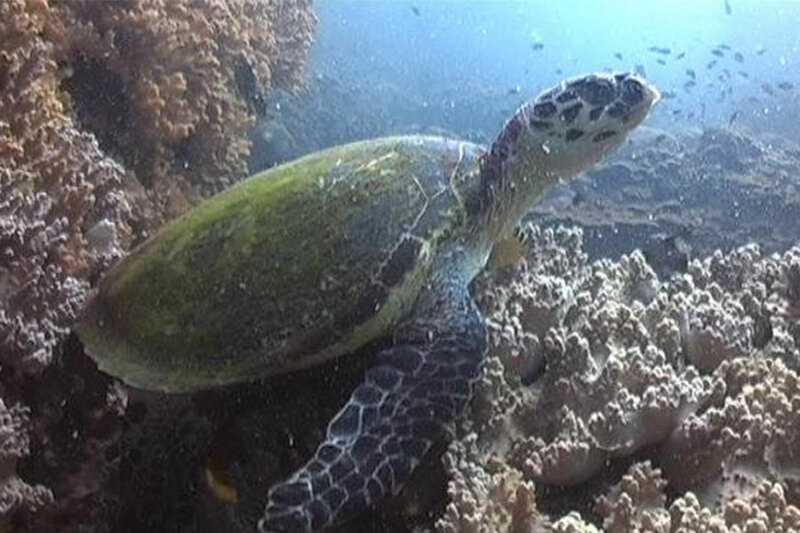 Here there is an important place of hatching of the free turtle, species at risk of extinction. The same evening or the next morning we will visit the reserve to see the turtles lay their eggs. Travelling on the beautiful road crossing a wonderful landscape we will arrive in Sur, a city located in a beautiful natural setting and for a long time the most important shipyard in Oman. Here we will visit the dhow shipyard where, in some periods of the year, we can witness the construction of these typical boats. We will stop at Qalhat, one of the oldest cities in the country, and admire the ruins of the Bibi Miriam mausoleum, once a magnificent construction of richly decorated coral blocks. The journey will continue in the direction of Muscat, crossing fishing villages including Tiwi, closed between the ocean and the cliff, the end point of the impressive Wadi Shab, in a deep cave. In the late afternoon, arrival in Muscat, where we will visit the outside of the Sultan's Palace, surrounded by beautiful flower gardens, and the colored suq with its perfumes. After breakfast, transfer to the airport and flight to Salalah, a modern city characterized by a tropical climate that allows the growth of coconuts, mangoes, papayas and other fruits. Upon arrival, hotel accommodation and lunch. In the afternoon visit of the museum and the suq. We will visit the surroundings of Salalah heading east through coconut groves to reach Kohr Rori, a large desert inlet separated from the sea by a strip of sand. At the center, on a rocky spur, are the ruins of Sumhurum, the ancient Roman Abyssopolis, a point of collection and sorting of incense that, by sea, reached the Mediterranean and Europe, where the Queen of Sheba lived for several years. Not far away, at the edge of the bay, stands a large reed bed where herons and flamingos come to rest. 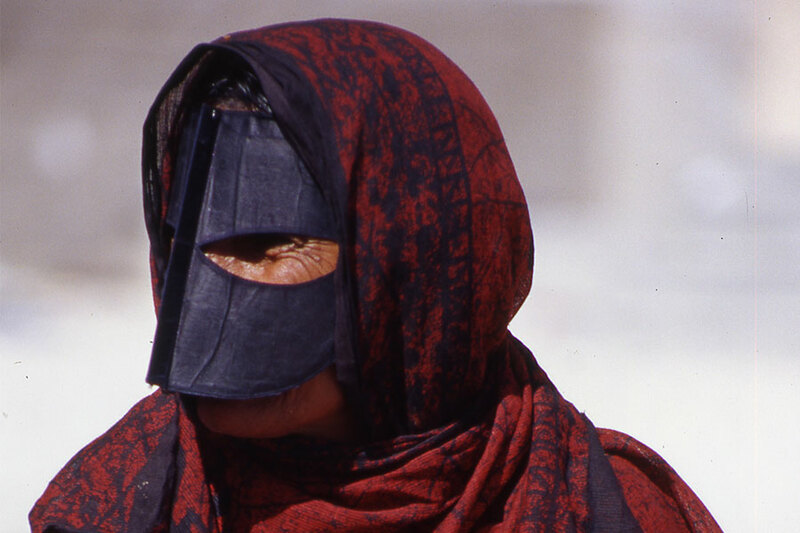 After the picnic lunch, in the afternoon we will visit Wadi Darbat, where ancient populations of jabali still live. Then we will go west of Salalah, to Mughsayl beach, characterized by the presence of natural fumaroles. Relax in the hotel until the transfer to the airport for the flight on Muscat and flight connection to Italy. 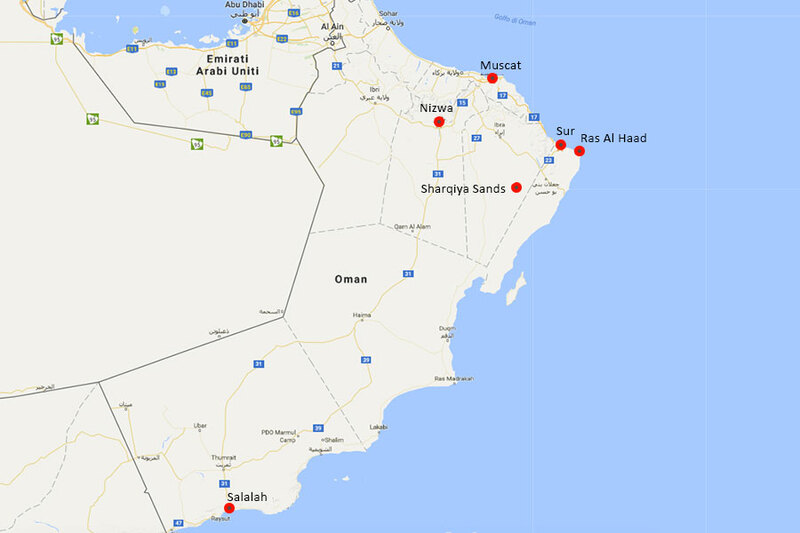 Transfer to the airport for morning flight Muscat - Khasab, welcome at the airport and transfer to the hotel. Free lunch. In the early afternoon, departure with 4WD vehicles for the Jebel Harim, the chain of rugged mountains of limestone origin that occupies the entire continental area of the Musandam peninsula. 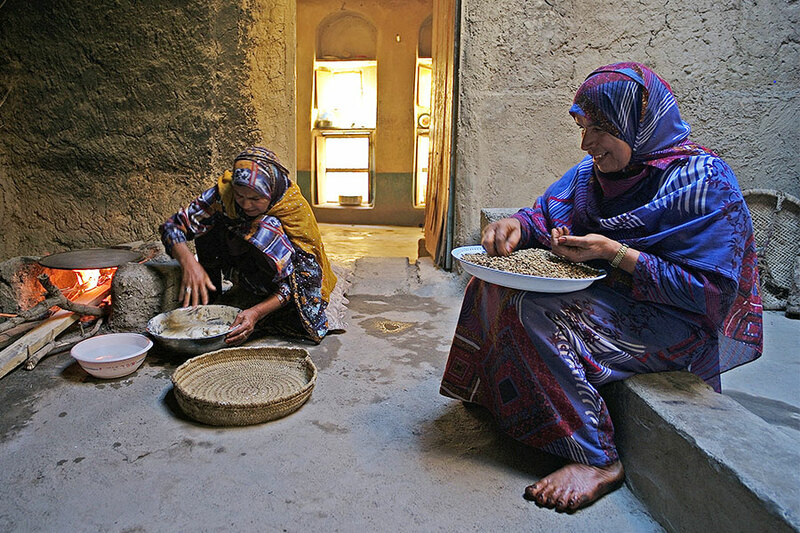 We will rise to over 1,100 meters in height, in an area inhabited by the Shihuh tribe, which is supposed to have migrated from Yemen many hundreds of years ago: small settlements of stone houses, some flocks of goats and isolated tufts of palm trees characterize the environment. The mountains are rich in fossils and prehistoric rock engravings to witness ancient human settlements. The most amazing thinks are the incredible views that suddenly appear in wild valleys that are lost towards the blue sea. 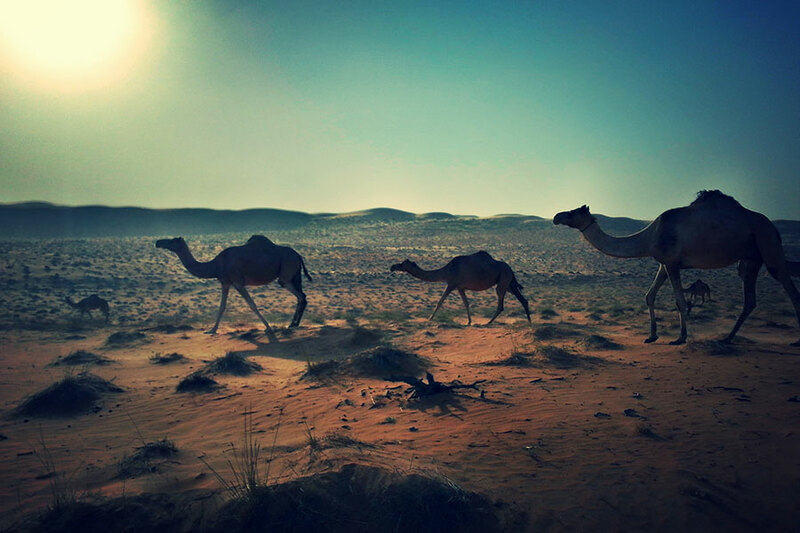 At the end, return to Khasab. After breakfast, transfer from the hotel to the port of Khasab. 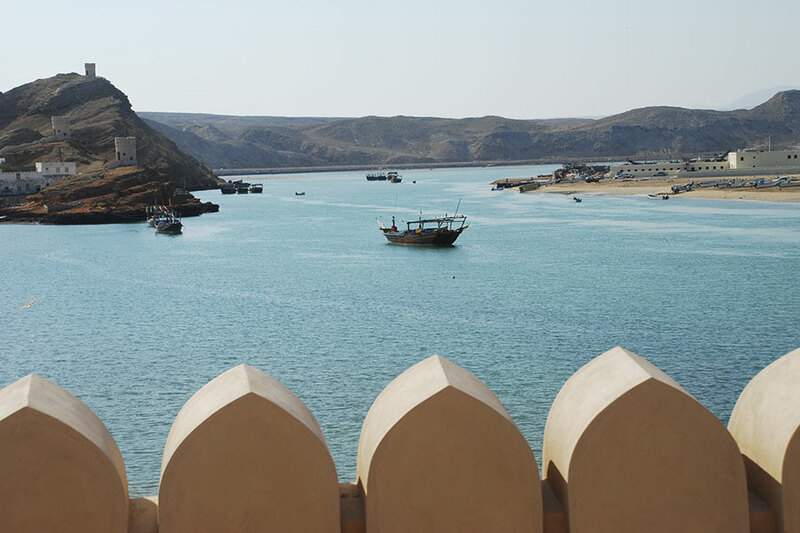 Day dedicated to visit the Musandam fjords on board a dhow, a typical boat of the Arabian peninsula. We will have the chance to admire beautiful natural scenery, swim and snorkel.